Home » News » Should I Make a Will? Making a will is arguably one of the most important things you can do for yourself and your family so the answer to the question ‘Should I Make a Will?’ is an emphatic – ‘Yes’. Not only can a will legally protect your spouse, children, and assets, it can also spell out exactly how you would like things handled after you have passed on. While each person’s situation varies, here are some reasons to make (and update) a will. 1) Your Will outlines how your estate will be distributed. 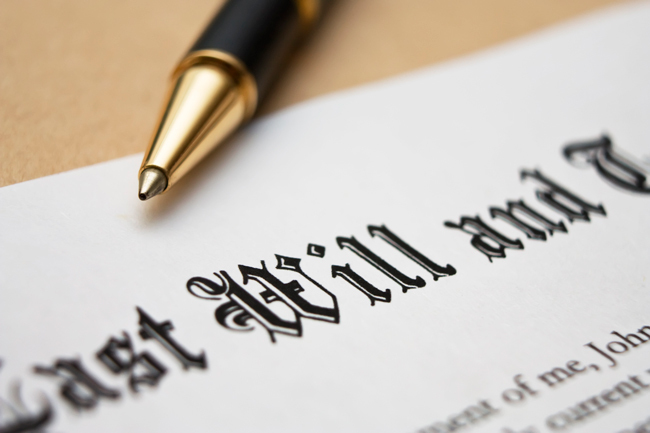 A will is a legally-binding document that lets you determine how you would like your estate to be handled upon your death. If you die without a will, there is no guarantee that your intended desires will be carried out. Having a will helps minimize any family fights about your estate that may arise, and also determines the “who, what, and when” of your estate. 2) Your Will determines who will take care of your minor children. A will allows you to make an informed decision about who should take care of your minor children. Absent a will, the court will take it upon itself to choose among family members or a state-appointed guardian. Having a will allows you to appoint the person you want to raise your children or, better, make sure it is not someone you do not want to raise your children. 3) Having a Will can avoid a lengthy probate process. Contrary to common belief, all estates must go through the probate process, with or without a will. Having a will, however, speeds up the probate process and informs the court how you’d like your estate divided. Probate courts serve the purpose of “administering your estate”, and when you die without a will (known as dying ‘intestate’), the court will decide how to divide estate without your input, which can also cause long, unnecessary delays and will involve unnecessary extra taxes (see next point). 4) Making a Will minimises estate taxes. Another reason to have a will is because it allows you to minimise your estate taxes. The value of what you give away to family members or charity will reduce the value of your estate when it’s time to pay estate taxes. If you do not make a Will and die intestate, the Irish government will take a very large amount of your estate, preventing your heirs from receiving what they would otherwise inherit. 5) In a Will you decide who will wind up the affairs of your estate. Executors make sure all your affairs are in order, including paying off bills, canceling your credit cards, and notifying the bank and other business establishments. Because executors play the biggest role in the administration of your estate, you’ll want to be sure to appoint someone who is honest, trustworthy, and organized (which may or may not always be a family member). 6) In a Will you can disinherit individuals who would otherwise stand to inherit from you. Most people do not realise they can disinherit individuals from their will. Yes, you may wish to disinherit individuals who may otherwise inherit your estate if you die intestate. Because wills specifically outline how you would like your estate distributed, absent a will your estate may end up on the wrong hands or in the hands of someone you did not intend (such as an ex-spouse with whom you had a bitter divorce). 7) You can make gifts and donations via your Will. The ability to make gifts is a good reason to have a will because it allows your legacy to live on and reflect your personal values and interests. In addition, gifts up to a certain ceiling are excluded from estate tax, so you’re also increasing the value of your estate for your heirs and beneficiaries and avoiding unnecessary taxes. 8) Having a Will avoids legal challenges. If you die without a will, part or all of your estate may pass to someone you did not intend. For example, one case involved the estate of a deceased son who was awarded over €1 million from a wrongful death lawsuit. When the son died, the son’s father – who had not been a part of his son’s life for over 32 years – stood to inherit the entire estate, leaving close relatives and siblings out of the picture. 9) Having made a Will you can change your options if your life circumstances change. A good reason for having a will is that you can change it at any time while you’re still alive. Life changes, such as births, deaths, and divorce, can create situations where changing your will is necessary. Once you have created a Will, it is very easy to change it at a later stage. 10) Should I Make A Will? Yes, because tomorrow is not promised. Procrastination and the unwillingness to accept death as part of life are common reasons for not having a will. Sometimes the realisation that wills are necessary comes too late – such as when an unexpected death or disability occurs. To avoid the added stress on families during an already emotional time, it may be wise to meet with a fully qualified Estate Planning Professional to help you draw up a basic estate plan at the minimum, before it’s too late.